Ask fellow campers about "Springfield Campground COE" and nearby attractions. Nightly rate is $26.00. With America the Beautiful Senior Pass rate is $13.00. This is a Corp of Engineer Campground and is very well maintained and clean. Dump station is excellent and you have the ability to dump in either direction. Campground is very quite and sites are located on the lake waterfront. Sites are spacious and nicely spaced. Our site was a back-in and was level. Bathhouse are cleaned twice a day with plenty of hot water for showers. We stayed for seven(7) nights and enjoyed the experience. We would highly recommend this facility. Other reviews mentioned an "Ant" problem, we experienced no such problem. Camp hosts were very friendly and helpful. Check-in was fast and efficient. We will visit again in the future. We camped at Springfield Campground COE in a Travel Trailer. This is a very nice COE park with most sites directly on the lake. We've camped here for years and always find it enjoyable. Yes there are ants in the warm months, but come prepared with some type of bait and you'll be fine. This is a fully wooded park with most sites spaced far apart and fairly level. You'll have a problem with satellite reception, though it's not impossible to find a site that's suitable. The roads are paved and make for an enjoyable bike ride. Our Verizon reception was alright, unlike an earlier review. There is no cable or Wifi, but the lake makes up for that with a nice quiet location. We camped at Springfield Campground COE in a Fifth Wheel. Eat at Sadlers Creek BBQ on Saturdays....awesome. Come early as they run out of some cuts, especially the ribs. This campground has the best sites on this lake. Most of the sites are large and a large percentage of them are on the lake and have awesome views. We enjoyed many sunrises and sunsets. You are about 10 minutes from groceries. The only drawback in this campground are the ants. Be prepared with your ajax or whatever you use for ants. if you deal with properly then it is no big deal. This campground is worth it even with the ants. We camped at Springfield Campground COE in a Travel Trailer. Nicely done COE park. Reserved online at the recreation.gov website (recommend you check it out if you haven't seen it yet). Highlights: nicely engineered -- the COE skill shines through in every detail of the park. Our site for our 43' Class A was almost perfectly level. The roads through the campground were paved and wide, giving excellent access to almost all the sites. The "could be better": ANTS!!! The first morning we woke up to millions of ants in our RV. Should have read previous reviews so we could be prepared. We coated the power and water lines with vasoline (stopped them cold) and made a quick trip to the local Ace Hardware who knew exactly what we were dealing with. Armed with several types of ant insecticides and traps, two days later we've battled them to a tie. There's still a few left. The internet thing was a challenge. If you are Verizon, 2 bars max which made any kind of streaming a frustrating challenge (no cable or internet at this campground). Finally, just know there's no sewer hookups and Lake Hartwell is currently down about 15 feet so our lakeside site is now about 100 feet from the water. Our first COE park -- good enough to consider again, but we'll read reviews closely. We camped at Springfield Campground COE in a Motorhome. Come prepared to do battle with tiny ants (millions of them). We noticed quite a few people put out some type of white powder around their tires and hookups. Will have to ask what they're using. 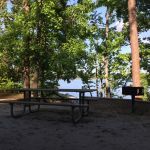 Large lakeside COE campground with huge sites, most with direct lake access. Roads are paved and clear. Most sites have shade. We were on a double site at $26 a night (single site would have been $13). Good water and 50 amp electric. Trees make satellite reception spotty. We camped at Springfield Campground COE in a Motorhome. On Saturdays, don't miss the BBQ at nearby Sadlers Creek B-B-Q. Power and water were fine and dump station was very easy to get to. Site was very nice and waterfront, plenty of room with picnic table and fire ring/ grill.Standard COE park that was nicely laid out and well kept up. We camped at Springfield Campground COE in a Motorhome. Get what you need on the way in. There is a great BBQ restaurant a few miles away, and a grocery store another mile or so past that. We had a great time and would definitely stay there again. Our site was very easy to pull onto and get level. We walked the campground and found most all the sites to be level and well laid out. We camped at Springfield Campground COE in a Travel Trailer. Awesome campground. 95% of campsites are lake front. All campsites are pretty level, many are pull-through. Pavement all around campground. Very clean bath houses. We LOVE to go here even though it is a 2 hour trip for us, it is SO well worth it. You have swimming, playground, boat launch, not sure on fishing, but all around great place to be to relax! We camped at Springfield Campground COE in a Travel Trailer. Go see the dam nearby. Very impressive. Shopping near by. Walmart, BiLo. Great campground, most with lake front sites. Always clean campground, friendly camp host. Just wish they were open all year. We camped at Springfield Campground COE in a Fifth Wheel. Awesome campground. All sites were lakefront and very spacious. Did not have full hookup but did have a dump on site. We will be visiting this campground often. We camped at Springfield Campground COE in a Travel Trailer. 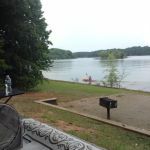 Very nice park on Lake Hartwell, which has both pull throughs and back-in sites. We stayed two nights, the site we were in was hard packed dirt/gravel and fairly level, within one or two inches. Some of the facilities and playgrounds looked new or recently added. Had Verizon 4G (two bars) and picked up about 30 TV channels OTA with a booster. Site had both a firepit and a grill along with a picnic table. We were about 25' from the water and would gladly return. We camped at Springfield Campground COE in a Travel Trailer. If you are there on a Saturday (only day they are open) eat BBQ at Sadler's. We stayed two weeks, the maximum, at this camp ground and truly enjoyed it. 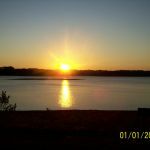 Virtually all sites are right on Lake Hartwell, and if you have a boat or a jet ski, you can pull right up to your site. The sites are spacious and well appointed. The only negatives were that there were no sewer hookups, and TV reception was non-existent. We stayed near the swimming area as our grandchildren were here, and it was clean and smooth with a small playground near by. We will stay here again and enjoy a beautiful lake. We camped at Springfield Campground COE in a Fifth Wheel. This was a very nice location, and the lake was awesome. As posted in past reviews there is an invasion force of ants which would not relent. Then the yellow jackets come by air. The lake was low so the mud is knee deep on the shore line. I called this the land, sea, and air invasion. The bathhouse was also a bit far from site 50. Overall the place is really nice if you want to fight off the ants. Well kept and clean. I do not like the fact you have to be in by 10:00 pm or as I was told you are not getting in, even if you're already set up. Oh, just down the road is Big Water Marine; you can rent a pontoon boat and cruise the lake which is breath taking. Another good thing is you're close to several stores for supplies but still feel you're in the middle of no place at the campground. We camped at Springfield Campground COE in a Travel Trailer. I feel a need to mention that a previous reviewer clearly identified the wrong campground, as Springfield is a very nice COE campground and not open in March so reviewer could not have stayed here. We have camped Springfield COE twice in nice sites but both times the ANTS were very industrious. First thing to do when arriving is ant proof your camp area and your TV. We use Comet brand cleaner and it works well. We stayed in site #18 and it was quite nice and private for a 34 ft trailer max with great lake views. I think sites #28-35 are very nice as well on a peninsula but much closer together. Lots of people here bring their camper and boat/jet skis as most sites like ours are lake front and people park their boats right at the sites for the duration of the camp stay. Bath house near our site seemed newer than the other bath houses. I think it is tough to beat the COE campgrounds on the lakes between Ga and SC for nice lake front camping. We camped at Springfield Campground COE in a Travel Trailer. This campground was a real joy to stay in. We had a huge flat site, with a patio area, large picnic table, fire pit and nice BBQ. We also had a little dock on the water which was great. The site was heavily treed and very private. The campground was VERY quiet and the people at the gate were friendly and helpful. Reserve America is very efficient. We decided to stay another night, called up the site on our phone (while watching a beautiful sunset) and reserved the site for another day. Our pass was waiting for us at the gate in the morning. Amazing. Highly recommended and we will stay here again. We camped at Springfield Campground COE in a Motorhome. Are you affiliated with Springfield Campground COE ?